I am primarily an historian but have always had a strong need to write. My particular interests lie with 16th and 17th century social history. Cornwall during the Civil War is an ongoing research area as are the Scottish Covenanters of the 1670s. Serendipitous discoveries often lead me down new research paths-who knows where they will lead? And for 2018, I am thrilled to be asked to be Writer in Residence for the fabulous and famous Morrab Library in Penzance which celebrates its 200th birthday. I can sense some great adventures with words in the months ahead! Watch my blog page for news! runner-up in the fiction for adults category. paperbacks or go to the Kindle Book store for digital editions. Historian turned novelist; Gamekeeper turned poacher? .For several years I provided living history services in schools using costumed interpretation to bring the past to life in the classroom. 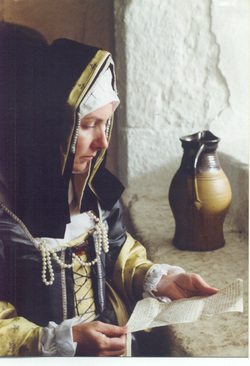 Consultancy work for museums and heritage properties followed, and I was deployed by English Heritage at Pendennis Castle in Falmouth from 1999 to devise and deliver interactive workshops for all age ranges. A spell as head of history in FE had me in the classroom for a while too. Back in 1995, when I came across the original documents relating to the siege of Pendennis Castle in the Cornwall Record Office, and was actually handling the very sheets on which the surrender had been negotiated, I was completely awestuck at being able to literally touch history. The compulsion to find out more led to the discovery that of nearly 1000 Royalists inside Pendennis in the spring of 1646, 200 were women and children! How did they come to be there? Why did they stay? And how could I give these unknown, un-named women a voice? This one historical novel set in the seventeenth century has been brewing since 1995. It's a very different novel to the one I planned then but 'Exposed to all Villainies' complete, revised, edited, poked about and generally sifted is out there in paperback and as an e-book. Now, in the odd way that sometimes happens with writing, I discovered that wasn't 'The End'. The three women, Grace, Hester and Mary, seem to have touched the hearts of readers and so in Book II, 'A Cord of Three Strands' readers can follow their progress from 1646 to 1649. The villain managed to wriggle out of that novel, and nobody likes untidy endings - or baddies that get away - so Book III had some work to do. Readers will meet a different narrator with a very different angle on the situation, and motives that, as he says himself, are 'knotty'. Three vows will be challenged: one by a woman; one by a man; one to a king. A Cornish fortress forged their friendship; a Cornish rebellion will test it. Writing has always been part of my life. Age 5 ¾, I created the ‘Adventures of Sam the Dog’, attracting the attention of my Infant School headmistress. Later there were epic letters, some extending to eight A4 pages, written to friends and family while I was at sea with my husband, a Merchant Navy officer. I'm hoping that soon I will have some I can put up on line, a bit of a lost way of Merchant Navy life, a wife on the ocean wave, you might say...hey, there's abook in there! I wrote an autobiographical ‘psychological scenic tour’ of my childhood haunts, scrawled during the long anti-social hours of the ‘doom watch’ during months on the BP Tankers. Have a look at the bit of panto-inspired silliness on the site as well when I'm writing with my grandchildren in mind! As seen on the BBC TV series 'Three Men in more than one Boat' and ITV1's 'All at Sea'. Photographs This page, top by Guy Marsh. Publication page, by Ross Kingsford.